Jayde Donovan is the co-host of Todd & Jayde in the Morning on New York’s 95.5 WPLJ and also serves as a syndicated red carpet host for Westwood One’s entertainment events. Jayde launches April 14 on more than 50 radio stations, including WPLJ-FM/NY, KLIF-FM/Dallas, KRBE-FM/Houston, and WWWQ-FM/Atlanta. The 3-hour show will air every Saturday. Prior to coming to New York, Jayde was the host of Hot Mornings with Jayde on Cox Media’s WPOI Hot 101.5 in Tampa, where she also hosted segments for WTVT Fox 13/Tampa Bay and WOFL/Fox 35. She was also co-host of Johnny & Jayde in the Morning in Orlando on WXXL/XL 106.7. While in Orlando, she wrote for Orlando Style magazine and was featured on the cover of Orlando Style, Orlando Magazine, and Think Healthymagazine. She was also voted a “Woman to Watch” by Orlando Women’s Newspaper. 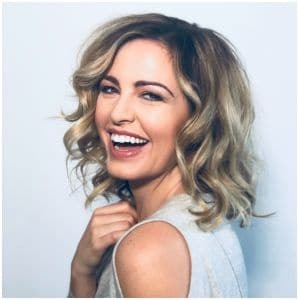 Jayde previously worked as a correspondent with Billy Bush on Access Hollywood, a fill-in co-host on LIVE With Regis & Kelly, and a co-host on the Bravo show Love Calling with Donny Duetsch. For more information about Jayde and how you can bring her show to your market, contact Neal Bird at nbird@westwoodone.com or (310) 840-4207.